Do you want to change the format of your video quickly and easily? 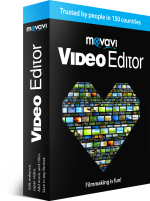 Try Movavi Video Converter – one of the fastest converters in the world! It uses several innovative technologies, including taking advantage of Intel® and NVIDIA® hardware acceleration to make the conversion speed as fast as possible. Video Converter supports a large number of media formats and lets you optimize your video for viewing on any mobile device. With this program, you can convert your movies, clips, and home videos without wasting your precious time. There are many other quick media converters on the market, but our tests have shown that Movavi is one of the fastest video converters you can buy. How did we achieve such high speed? Movavi Video Converter supports cutting edge technologies, including a special SuperSpeed mode which makes the conversion process faster by up to 79 times, and NVIDIA® CUDA, NVENC, and Intel® HD Graphics hardware acceleration**. The SuperSpeed mode involves a type of video processing called remultiplexing, or remuxing, when converting is done without decoding and re-encoding the video. As a result, the conversion speed is increased significantly, with zero quality loss. What is Intel® Hardware Acceleration? By taking advantage of Intel® Media technology, Movavi Video Converter uses your Intel® processor's full potential to accelerate video conversion. 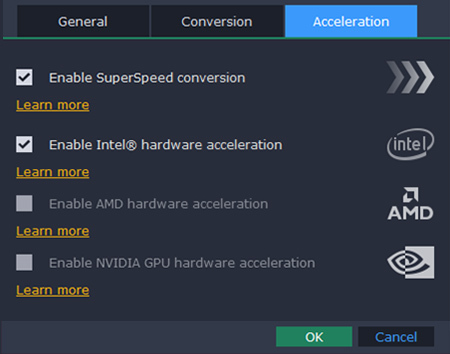 What is NVIDIA® Hardware Acceleration? Movavi Video Converter is optimized for NVIDIA® CUDA and NVENC, providing faster video encoding on NVIDIA® graphics cards. What does parallel CPU and NVIDIA® GPU conversion mean? This means that you can convert two videos simultaneously, using the CPU for one file and the NVIDIA® GPU for the other. It's particularly useful when you need to encode a number of videos in a short period of time. Click Settings in the upper right corner of the program interface and select Preferences. By default, the program automatically enables those options supported by your hardware. 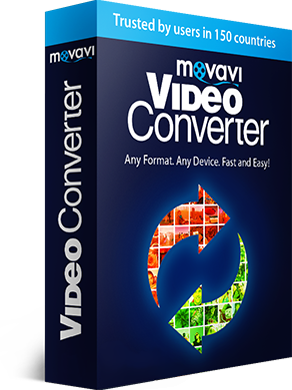 ** NVIDIA® CUDA, NVENC, and Intel® HD Graphics hardware acceleration support are only available in the Windows version of Movavi Video Converter. SuperSpeed mode is included in both Windows and Mac versions of the program.